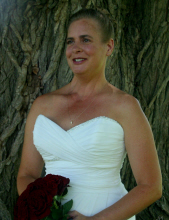 Kristie Lynn Scherer-Jaworski, age 48, of Slinger, Wisconsin passed away Wednesday, August 22, 2018 at her home surrounded by her loving family after a 28 year long battle with cancer. Kristie was born on January 28, 1970 in Milwaukee, Wisconsin to Roland and Susan M. (nee Krygier) Scherer. She was united in marriage to Allen J. Jaworski on August 6, 2011 in Hartford, Wisconsin. Kristie was passionate about her pets as well as volunteering and supporting the Washington County Humane Society. She enjoyed working as an accountant where she was able to make many cherished friendships. She doted on her nephews and nieces and enjoyed the outdoors. Kristie is survived by her loving husband, Al; dear father, Roland Scherer of Hartford; loving brothers Steven Scherer and Nicholas (Becky) Scherer of Hartford; her nephews and nieces (Dominic, Isaac, Samuel, Abigail, and Caroline); and her beloved dog Trixie. She is further survived by beloved aunts, uncles, cousins, other relatives, and friends. She is preceded in death by her mother, Susan; infant brother, Anthony; parents-in-law, Gerald J. and Mary Jaworski; and beloved dogs, Halston, Duncan, Dusty, and Ziggy. A Memorial Mass for Kristie will be held Thursday, August 30, 2018 at 6:00 p.m. at St. Kilian Catholic Church (264 W. State St., Hartford, WI 53027) with Fr. David LaPlante officiating. Family will greet relatives and friends at the church on Thursday from 3:00-5:45 p.m. Private interment in St. Kilian Catholic Church Cemetery, Hartford, Wisconsin. In memory of Kristie, memorial contributions to the Washington County Humane Society are appreciated (WCHS, 3650 State Road 60, Slinger, WI 53086, Attn. Chris Fleischmann). To send flowers or a remembrance gift to the family of Kristie Lynn Scherer-Jaworski, please visit our Tribute Store. "Email Address" would like to share the life celebration of Kristie Lynn Scherer-Jaworski. Click on the "link" to go to share a favorite memory or leave a condolence message for the family.